Ever been to an underwater hotel? These 7 underwater hotels redefine luxury at its best. With plans underway to build The Water Discus complex, a 1,000 sq. metre underwater hotel, restaurant and spa, in Dubai, plus an underwater theme park inspired by Avatar and the Pirates of the Caribbean, Dubai is leading the charge in redefining adventurous luxury. 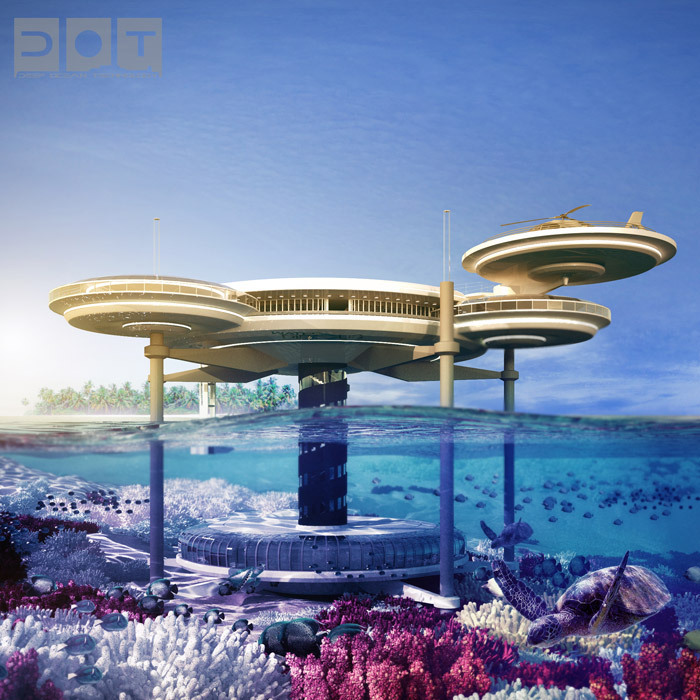 In 2013, Dubai unveiled plans for the Water Disqus Hotel where guests also have the option of sleeping below the surface of the sea. The 21-room complex would feature large disc-shaped buildings both above and below the water, with facilities including a bar and a dive centre. The hotel’s “legs” would actually be lifts, transporting guests between the two sections. That same year the city of Dubai announced its plans to become the ‘world’s most visited city’, attracting 20 million tourists by 2020 to coincide with the Expo 2020, an international architecture and technology trade fair which is expected to bring $23bn into the emirate. Here, we count down the worlds top ten underwater hotels, for adventurous tourists to explore. According to the hotel, guests have a variety of adventurous activities for those who wish to explore the unimaginable, like maneuvering a personal Triton submarine through a lagoon, exploring the ocean’s depths as the passenger of a 1,000-foot luxury submersible, and scuba diving in pristine waters. Guests who prefer solitude will find the epitome of relaxation when indulging in marine-focused spa treatments and meditation. This hotel has something for guests adventurous at heart or those just seeking relaxation. The hotel was made with almost measurements of 66 feet, under the ground floor of the historical Persian Gulf, and just a few miles to the Jumeirah Beach. Presently under construction in the city of Dubai, Hydropolis Hotel Dubai will feature three parts: the land post, where visitors will be greeted, the connection subway, which will convey individuals to the center place of the hotel, and the 220 suites found in the underwater leisure complex. It is one of the biggest modern construction projects in the entire world, having 260 hectares, about the same size of Hyde Park of London. If youre a Hilton Honors Diamond member – this one you will love. The all-glass Ithaa Undersea Restaurant at the Conrad Maldives Rangali Island Resort is the first in the world located underwater. Guests can view the incredible marine life of the Maldives while dining on spectacular, seasonal fare. Guests have described this experience as ” a heart-stopping experience” that awaits you in the underwater room at the Manta Resort. The floating structure, Swedish engineered, provides three levels, those above the water clad in local hardwood, and each an experience in itself. The landing deck, at sea level, has a lounge area and bathroom facility. A ladder leads up to the roof which has a lounging area – for sun worshipping by day and by night you can lie back and simply stargaze. Then downstairs – the magical feeling of lying on a soft double bed surrounded by panes of glass affording almost 360 degree views – watching the shoals of reef fish and exquisite, often rarely seen individuals visiting your windows. There’s also an underwater hotel (or submarine) in the Caribbean. If you have deep pockets the steep $136,000 pricetag per night should be no problem. The ultimate underwater couple’s experience can be yours at Lovers Deep, a luxe submarine that accommodates two and can be anchored off the Caribbean island of your choice. Complete with champagne on arrival, speedboat transfers from the beach, it’s a romantic and unique way to see colorful Caribbean marine life.